The new musical ‘Stop the Train’ is pulling into Todmorden Hippodrome on December 12, on the last stop of it’s 2015 tour of the North West. After several successful years in the music industry the show’s creators Rick Guard and Phil Rice are now platinum selling songwriters who have had hits around the world. Stop The Train is their labour of love. And now having spent five years creating it the pair are determined to see it all the way to the West End. If the show’s growing list of fans and supporters is anything to go by, it won’t take them long. Lancashire MP Nigel Evans, wowed by a performance, invited the production to perform on the terrace at The House Of Commons. 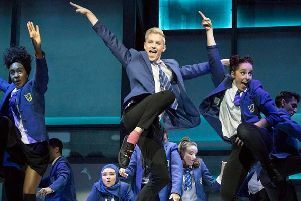 The show has also teamed up along the way with Virgin Trains to perform impromptu flash mobs at stations in various theatre towns. Stop The Train is a deliciously life affirming and uplifting dark comedy, wrapped in a twisting love story with a heady mix of songs, tension and humour. It follows a group of workers on a busy commuter train, where the unorthodox behaviour of a mysterious passenger awakens dreams and ambitions. The musical features a cameo appearance from stargazer Russell Grant, who is a huge fan. The entire cast and crew are talented actors from the region who have professionally trained at North West performing arts colleges and at London based colleges such as RADA. Said Rick: “I’m so grateful that we are gaining such momentum in such a short time. The programme about Stop The Train will chart the progress of a fledgling musical’s journey from Lancashire to the West End.